Hello from Pomegranate World! We love to eat pomegranates and want to share our favorite pomegranate recipes with you. Here are recipes for pomegranate cocktails, pomegranate martinis, desserts, pomegranate chicken, and other healthy and delicious treats. We’ve go the perfect pomegranate appetizer recipe for you: Pomegranate Guacamole! It is an all time favorite. Why not try pomegranate stuffing or these wonderful sweet potatoes with a pomegranate glaze! They make a great side to a family meal with a glazed turkey. Pomegranate cocktails are festive. This season go ahead and mix a a Pomegranate Martini! This easy and delicious pomegranate drink is one of our favorites. Here are some other pomegranate cocktails perfect for entertaining: the Champagne Pomegranate Cocktail, or the delicious Pomegranate Punch. Pomegranates are a wonderful way to add a festive and healthy touch to your meal. This year, we suggest this delicious and healthy pomegranate salad with roasted walnuts, or this wonderful pomegranate fruit salad. We have an endless variety of pomegranate recipes for you–whether you want a lunch full of antioxidants, a healthy dinner, or a brunch to share with friends, you will find the perfect ways to incorporate pomegranates into your menu here. PS: If you’re interested in gin and pomegranate cocktails, then check out our new site with a special selection of gin cocktails. 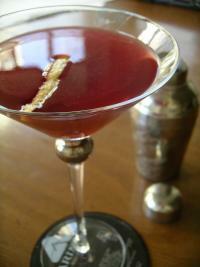 The pomegranate martini is a sweet & tangy cocktail, is easy to make, and tastes delicious. It is a great way to toast the holiday season! Click here for the recipe.